Yesterday on April 4, the 1st game of the 24th Asahi Open Championship match(3 wins match) between Asahi Habu and Fujii 9dan was held. 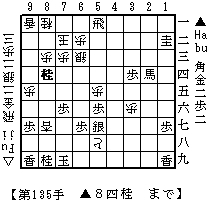 As a result of Furigoma, Habu played Sente(first mover, lower side of the diagram). Habu won it with 135 moves. The score after the game is 1-0 led by Habu. This must be a good reference for the progress in joseki of quick attack in the opening of Shikenbisha(4th file rook) and Ibisha(static rook). I was at a big room yesterday in Asahi Newspaper HQ building in Tsukiji, Tokyo to watch Kimura 7dan's commentary show using a big shogi board and presentation screen. According to Kimura 7dan, Fujii was in the advantageous position at the time of trading Bishop for Rook. But Habu turned around the position somewhere after the trade. You can replay the full game record here(Attention, it may not work well if you access from outside Japan. I have plural inputs that it could not be replayable although I had no problem to replay the moves(added on Apr. 6). Flash Player needs to be installed to view the gameboard). The diagram above is when Habu made the 135th move such as N*8d(check) and Fujii resigned. Habu had a Bishop, two Golds, and two Pawns in hand. The mating line after the N*8d would be a bit easy. Gote(upper side) had two choice responding to it; K-8b or Px8d. In case of K-8b, then B*7a would form an instant mate. In case of Px8d taking the kNight on 8d, then the following mate line would be expected:B*6a K-8b G*8c K-7a B7b+(mate, check by two pieces such as +B on 7b and R on 5a).